Why do grown men sleep on the street overnight to buy video game systems? How do Dollar Stores cheerfully charge a dollar for a 25 cent pack of gum? What are the pitfalls of Brand Name Loyalty? And how do you get an entire car-full of pudding for free? “Stand-up economist” Sam Pocker delves into these hard-hitting questions—and the result is a fascinating, wry, and amusing account of consumers’ non-sensical habits and the stores that prey upon them. With a dash of vitriol and a dose of sarcasm, Pocker exposes the sheer inanity of marketing schemes, the plague of rude cashiers, and shows how the “little guy” can rise up and beat the system by outsmarting the stores with their overly-complicated rules for rebates. 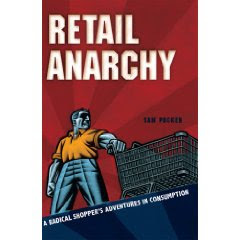 Retail Anarchy is a satirical look at the self-imposed consumer coma that America has fallen into—and Sam Pocker’s mission is to wake readers up! I’m really not sure how to describe this one. The book is listed under many headings on Amazon including both Business and Humor so I don’t know if it’s all tongue in cheek or just plain mean. There is a ton of great information to be found within the pages that I’m grateful to have learned but the delivery was at times offensive. To be fair the author does offer a disclaimer which reads, “This book is full of opinions; some are nice and some are not so nice, just like your own.” but I was still a little insulted by some of his remarks. The book is Pocker’s way of showing us how to find a much better deal but do we have to be called stupid because we’re not as enlightened as him? And he doesn’t stop there. If you’re an employee at Target, Pocker is of the opinion that not only are you stupid but lazy too. Another annoying thing is that Pocker writes about deals as if they are set in stone. If you happen to have a coupon for $1 off an item, your store WILL double it and the item WILL be on sale for $1.00 so you WILL make a profit of $1.00 on the deal. I don’t know about your area but all my local grocery stores only double coupons up to $0.55 and I guess if I hang on to the coupon for long enough the item will go on sale but more than likely I’ll be a stupid sheep and pay much more than he does. The bottom line is that I like learning about how to take advantage of the many opportunities to save but the delivery prevented me from rating it higher than 3 stars. It's too bad this one didn't live up to it's promise. From what I've heard so far, he sounds like an awful person.